How Long Does It Take for a Cat's Milk Supply to Dry Up? Cats are mammals so that means they nurse their young until their kittens are weaned and eating food on their own. But how long does a cat nurse for and when does its milk supply dry up? Cats can get pregnant before they are a year of age and are pregnant for about two months. Lactation will begin when they are about to give birth. Cats usually have eight teats and they will all produce milk. Cats that are not pregnant, and sometimes even spayed, can produce milk and this is called a false or pseudopregnancy. Hormones in a cat’s body control this production of unnecessary milk. If your cat is not pregnant but is lactating, do not allow it to pretend to nurse items such as toys or socks, as this will prolong the pseudopregnancy. 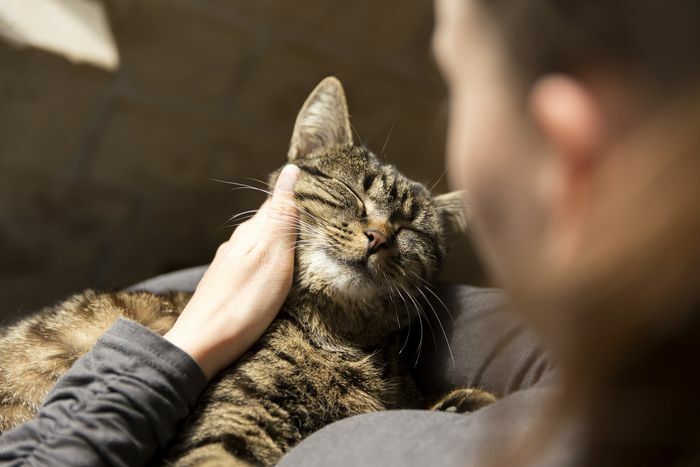 Pregnant cats will experience swelling to their teats about halfway through pregnancy but they will not begin to lactate until a few days before they give birth. Their appetite will increase during pregnancy to help provide the extra nutrition that their bodies need to produce milk. Once they give birth, the kittens will need to receive the first milk that the mother cat produces called colostrum. This special milk has important nutrients in it that newborn kittens need to properly grow and be healthy. Once the kittens have been nursing for about a month, they will begin to wean off of their mother. A liquefied kitten food should be offered to the kittens freely while they still have the ability to nurse from their mother. Over the course of the next 6 weeks, the kittens will slowly eat more kitten food and nurse less. The kitten food will go from a liquid to a watered-down canned food, to regular canned food, then moistened kitten kibble, and finally hard kibble during the weaning time until it is ready to leave its mother at 12 weeks of age. You should limit the time a kitten has to nurse the older it gets if it is eating on its own. If a kitten is eating well on its own but still wants to nurse a lot, you will have to restrict the kitten from accessing its mother for part of the day. A cat should be able to produce enough milk for all of their kittens. Cats typically have about five kittens per litter but if a cat has an exceptionally large litter it may need supplemental nutrition in order to help its body produce enough milk for its young. If you are concerned about the nutritional needs of a mother cat, discuss what you can do with your vet. Your vet may recommend a diet for your cat that has more fat and protein in order to accommodate the additional stress of feeding kittens and energy requirements lactation demands. At weeks three or four of nursing, the mother cat is at its most stressful and demanding point of lactation. The mother cat’s body has been producing milk continuously for about a month now, but it is also about to slow down. Since the kittens are starting to wean off their mother’s milk at this time, less milk will be needed. Mother cats will continue nursing as long as they have kittens to feed. This is helpful if you have a litter of kittens that need to be fed and have been abandoned by their mother but it is not necessary if you only have kittens who are now eating solid food. Once kittens are eating solid food, they usually don't try to nurse so the milk production will dramatically decrease in the mother cat. The milk should be completely dried up after a couple of weeks but this is a gradual process. The teats will still be swollen initially and produce milk. Then the milk will stop coming, the swelling will decrease, and after one to two weeks, the mammary glands should no longer be swollen under the teats. If your mother cat's teats have remained large, red, and swollen after a week of not nursing, you should have your veterinarian take a look at them. Mastitis is a serious and painful condition if left untreated and may require medications.